Don Violi has appeared on The Adelaide Show twice before, once covering history and trivia of South Australia and then giving us an insight into the world of hairdressing. Tonight, on our 200th episode, he takes us into his home to teach us the art of making salami. This week, the SA Drink Of The Week is home made limoncello. Steve will try to stump us in IS IT NEWS on the topic of the Garibaldi poisoning. In 100 Weeks Ago we hear from Fernando Gros, about his take on what it means to be creative and make things yourself. And in the musical pilgrimage … our musical curator has picked a track he says is well seasoned for this episode. [Congrats from Joy White, Homestead Lovers.] Be Nigel and clap. I was at Hallett Cove Conservation Park recently and must say bravo to the residents who stopped development of that area some decades ago. It is a priceless piece of geology. Thanks to Professor Flint for his Footsteps Of The Dinosaurs trek through the park. Well worth it. Learned a lot. 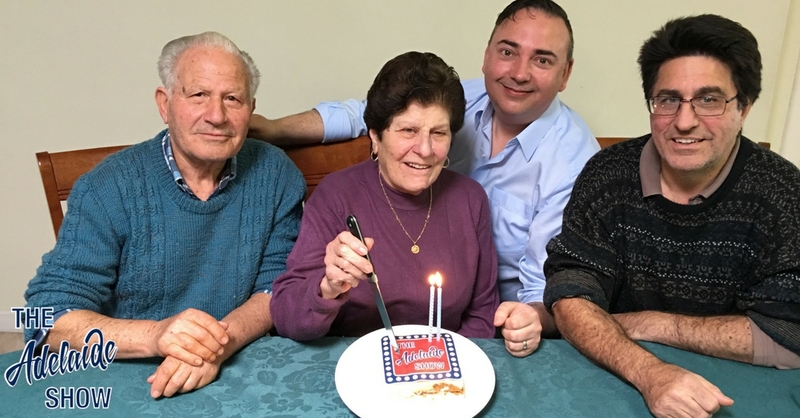 A discussion with Madge, Tony (Nino), and Don Violi about making salami at home. Don has previously appeared on The Adelaide Show, discussing hair trends from his day job, running Khrome Hair Studio. Steve challenges the panel to pick the fake story from three stories from South Australia’s past. To examine the 1995 outbreak, one must step back to 1991, to what was referred to as the ‘Gallicho wedding’. At that wedding, up to 100 guests contracted salmonella from Garibaldi salami. Following the wedding, a conference took place with several representatives of the South Australian Health Commission (SAHC) to discuss the ramifications of this incident. The conference highlighted the unique quality control standards employed by Garibaldi, including it dating system. A system so modern that they could not trace the raw materials that went into the salami that caused the salmonella at the wedding – meaning they could work out exactly what batch caused the sickness. The Director Of Public Prosecutions, Paul Rofe QC, charged Garibaldi Smallgoods’ Lou Marchi, Paul Marchi, and financial controller, Neville Mead, with her manslaughter but the charges were dropped. The two directors pleaded guilty to the charge of creating risk of harm and were fined $10,000 each. The company closed soon after. THE poison Garibaldi mettwurst saga is finally over, with all 23 victims having received compensation and free health care for life. In 100 Weeks Ago, we dig into the vault to find a snippet of our interview with Fernando Gros, a writer, musician, and photographer, who had just released a book, No Tools Required.In this snippet, I had just asked Fernando to talk about the things that drain our ability to be creative, and apart from television, he also singled out the way we use social media can rob us of brain space for creativity. And our song this week is Looking Back by Andy and Marta, selected by our musical curator Dan Drummond.